adidas and Chelsea have been a long standing relationship for some time now and through the years we have seen some pretty classy designs as a result. This year is no different, with both the home and away-shirt going the safe route. Now Chelsea have a third-shirt joining the bunch, which is black and white, so yeah, also a pretty stylishly simple kit. Now I actually really like the design of the shirt and especially the dynamic stripes running up and down liven up the shirt. I do however feel that adidas have missed a chance to really go a bit nuts and try something completely outside the box, because that’s the liberty you have with a third-shirt. 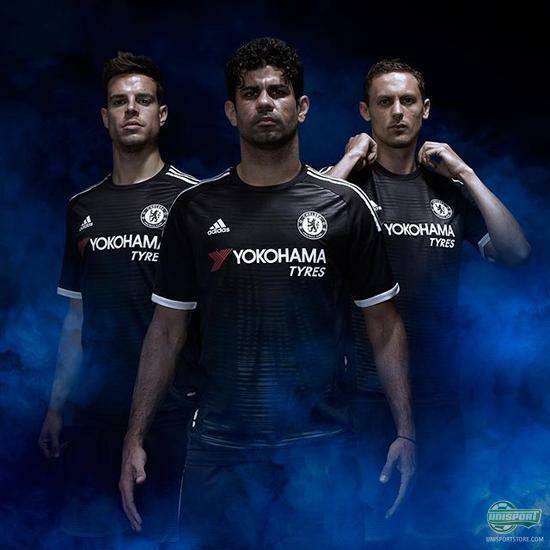 You can get your hands on the new adidas Chelsea third-shirt for the 2015/16 season in our club shop right here. Chelsea have had several black kits in the past, but adidas have always spruced them up with some orange, yellow, or light blue detailing. I guess the Chelsea players will let the football do the talking on the pitch, because the new 2015/16 third-kit won’t be stealing any attention from Hazard’s quick feet, or Fabregas’ fancy passing. The beauty is definitely in the simplicity for Chelsea and adidas here. It may sound like I’m not a fan of the new 2015/16 Chelsea third-shirt, but actually it’s quite the contrary and I think more brands and clubs should go with black kits like this. What do you think - is a little more class refreshing in a world of bright kits and boots, or is a black and white kit too boring for Chelsea?